Melt the butter or margarine until just melted (don’t overheat). Stir in sugar, bananas, and eggs, and mix until smooth. Combine flours, salt, and baking soda and stir into banana/sugar mixture. Stir in the nuts. I found this recipe in one of Bernard Clayton’s books. He says that this bread tastes best when it has been allowed to “age” for at least half a day… we think it tastes great freshly-made, too. It also freezes well. Thank you so much for this recipe! 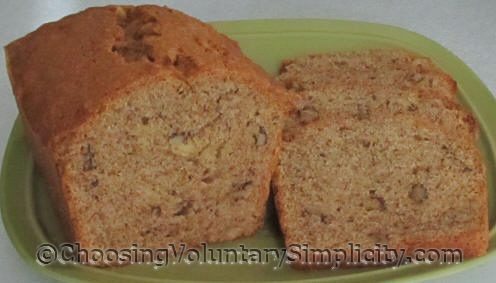 I have been looking all over for a good banana nut bread recipe and this one looks like it fits the bill perfectly. I also took a look at some of your other posts and I can see that I’ll be coming back here for a long time. Thanks for the great work! I came here through a link from another blog from someone who is going to make your bread for Thanksgiving. I’m so glad I saw that link. I spent hours yesterday here and there is still so much more to read. I made this bread as a trial run for our Thanksgiving family feast and it was *fantastic*! I can’t thank you enough. My family usually doesn’t like bread made with whole wheat flour but they sure did like this one. Thank-you for all the work you do in writing this blog. I am a very loyal fan.